Following a tragic car crash, twin zoologist brothers become obsessed by death and decay. After more than a decade of neglect and indifference, it's fallen to the British Film Institute to finally do justice to director Peter Greenaway's film work. Several laserdisc and DVD companies have released Greenaway films, but none of their discs have been very satisfactory. Not only has the BFI Video given the films a fresh transfer, but they've also elicited the support and contribution of Greenaway himself to create bonus material which helps to explain the director's off-kilter storytelling. Greenaway's painterly imagery, captured here by the brilliant French cinematographer Sacha Vierny, marking the first of their many collaborations, is well-served by the BFI's 1.66:1 anamorphic transfer. Greenaway's films don't generally transfer well to home video formats. Their delicate colour schemes and rich detail are usually dulled and blurred. The BFI's DVD transfer is preferable to the Amercian disc, from Fox Lorber which, in any case, does not feature any supplemental material. The BFI's presentation isn't flawless. There are fleeting instances of film and negative dirt throughout. Some sequences have shadowy areas that aren't as finely nuanced as they perhaps should be and picture detail isn't impressive, but generally it's better than could reasonably have been expected. There are some shots (the one at 86m16s, for example), featuring closely-grouped vertical lines which might cause moiré problems on some displays. Greenaway's palette is generally subdued, but it's punctuated by splashes of vivid colour, which are nicely-reproduced by the DVD. Image stability is much improved over some of the previous versions, and there are no signs of excessive edge-enhancement, or encoding artefacts. The average bitrate is a very healthy 7.29Mb/s. The layer change is well situated and unobtrusive. The disc contains subtitles in French and Dutch, but not in English. Making it possible to market the film in other countries is obviously more important to the BFI than making the film accessible to British viewers with hearing difficulties. The film's mono soundtrack, presented in 2.0 format at 224kbps, is adequate. It's a shame that the film didn't have a stereo soundtrack, to broaden the soundstage and add spaciousness to Michael Nyman's wonderful baroque score. The disc has very nice animated menu screens. 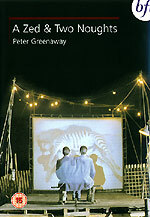 The disc features an excellent collection of supplementary material, which should fascinate Greenaway's many admirers. Greenaway pauses only occasionally in a very interesting commentary, in which details his admiration for Vermeer, and discusses how it has influenced the film. Sometimes he falls into the all-too common trap of describing what anyone watching the film would be able to see for themselves. The commentary contains a lot of information about Greenaway's intentions and ideas, but this doesn't leave much room for discourse on the nuts and bolts of production. Interestingly, Greenaway reveals that if he had the opportunity to re-make any of his films it would be this one. The origins of this footage, a decidedly oblique look behind the scenes of the film set to Tangerine Dream-type music, aren't explained. A bit of research reveals that the source documentary is only twenty-three minutes long, so it's a shame that the rest of it wasn't included. The disc includes a short trailer for The Draughtsman's Contract (which is also available from the BFI), and another for A Zed & Two Noughts, which is narrated by Joss Ackland. It's interesting to note that the A Zed & Two Noughts trailer features at least two shots that aren't the same as those in the finished film (a shot of Ackland's character attaching a cable to a crocodile, and a shot of Barber's character sitting on the bed with one of the two brothers). Those accessible from the Special Features menu include a reproduction of the Press Book (large enough to read, it contains an extensive filmography for Greenaway up to that point, and credits for many of the other cast members); a set of storyboards for the Snails sequence; Decay - access to a menu of six time-lapse sequences, some of which are different from the ones used in the finished film; and a Gallery of about twenty black and white photo's.